Aside from the typical door locks we know, there are locks that fits the new trend of consciousness when it comes to home security. When talking about the new trend, this merely focuses on high-end type of locks and home security systems. Installing smart home devices these days requires professionals, such as locksmiths. There are some individuals who choose to install the system on their own by following some DIY instructions. In any of these cases, thorough testing of the devices should be done to ensure that none of its components malfunction. There are a wide variety of smart home devices you can find in the market today. Some of these devices require complex installation requirements while others are quite simple. Chicago Locksmiths lists and discusses some of the commonly used devices. The Schlage Sense Smart Lock embodies everything that smart locks have the potential to be. For the most part, most automated lock devices are made to increase comfort and convenience for homeowners – but they absolutely still should be able to perform their primary function of providing stellar security! The Schlage Sense delivers- it can detect when somebody unlocks the door with they key or keypad and has a built in siren which will go off if someone tries to force the door open. In addition to these fantastic features, the Schlage Sense is equipped with an ANSI Grade 1 deadbolt, which is the highest security rating that deadbolts can be given. 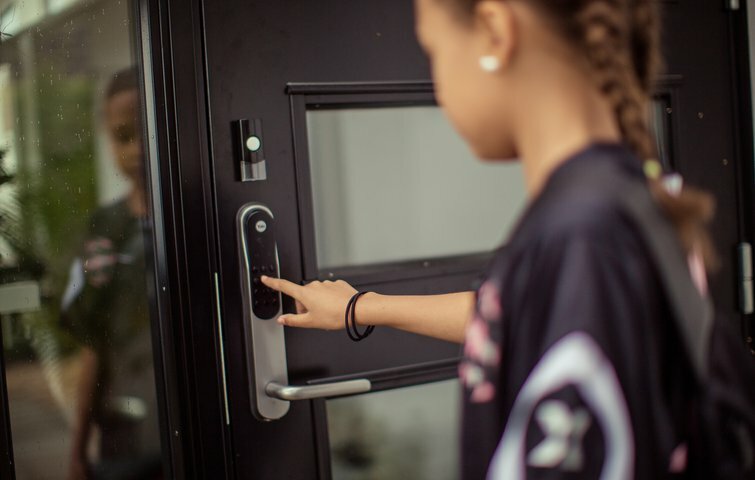 The lock can be remotely controlled through an application, and has an incredibly dense and durable lock cylinder that provides customers a high level of quality as well as a convenient and sleek interface. This device primarily functions as a home speaker, however it boasts a wide range of other functions. It has voice activated automation integration functionality, that can help play music from streaming services, turn on your thermostat, and even unlock your front door. This smoke alarm has been growing in popularity since it was released. It works alongside the Nest Learning Thermostat in a manner of efficiency rare among automated smoke alarms. With a seamless setup process and functionality within tablets and smartphones, these alarms can be purchased in battery operated or circuitry wires iterations. The Nest Protect can send notifications straight to homeowner’s devices, which helps provide them direct notification of any events even when they’re not home. Because of this, the alarm can test itself and ensure that all of it’s components are functioning properly. This automated doorbell connects via Wi-Fi and allows for remote video monitoring that shows someone a life feed of the surveillance camera. It’s rain and weather resistance. It has the added benefit of alerting homeowners to any potential dangers rather than simply notifying you of a break-in, or attempted forced-entry after the fact, once it’s too late. Read this full article at http://chicagolocksmiths.net/chicago-locksmiths-blog/smart-home-devices/. There’s nothing wrong though if you are not yet ready to shift from the traditional types of locks to these smart home devices. But if you want to still make sure that your home is safe, consider changing your locks. You can hire a professional to change your locks. The same applies if you have a business establishment and you had to let go of an employee. If it’s your habit of providing your staff a duplicate of your main door key, this is required. I encountered a post some time last year that talks about locks change and locks rekey. The requirements of locks and security never grow old. Thus, let me share some bits of the discussions of this blog on “The Difference between Locks Change and Locks Rekey” at http://www.endhereditaryreligion.com. When your lock is completely damaged and irreparable. When the condition of your lock is poor or weak. When you need extra security for a premise, or you want to upgrade your existing security features. You purchase a new home and are unsure of how many sets of your house keys are out there. You have lost your key, or it is worn out. You trusted your keys with someone who is no longer trustworthy such as an old employee or former housemate. There’s no reason for you to stop yourself from changing your home security system, your locks and your keys unless if you are in a tight budget. So if you are really in a budget, do not hesitate to search online for the most affordable lock system to install and locksmith to hire.